Eagle's Model 1975 24 Gallon, Self-Closing, Wall-Mount Safety Cabinet is constructed of 18-gauge steel. The sides, top, bottom, and doors are double-walled with a 1 1/2" air space between walls. The flammable metal storage cabinet includes two vents, each has 2" threaded fittings and fire baffle and cap. 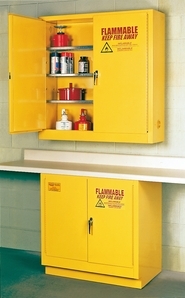 Standard Flammable Liquid Safety Cabinets come in yellow high gloss powder finish with red warning, plus grounding attachment, 3-point latch system, and 2" raised, leak proof door sill. Each shelf is adjustable, supported by 4 brackets, and can support 350 pounds. (All Eagle metal cabinets meet NFPA Code 30 and OSHA requirements).